The heart has four chambers: two chambers at the top, the right and left aorta; and two chambers on the bottom, the right and left ventricles. The left ventricle is responsible for receiving oxygenated blood from the lungs and pumping the blood out into the aortic valve, the main artery of the body, which feeds the oxygenated blood to all parts of the body. Hypertrophic cardiomyopathy (HCM) affects the left ventricle, and its functional ability to pump blood into the aorta. The normal, healthy left ventricle is already thicker than the right ventricle, owing to its greater workload in pumping blood out into the body. In hypertrophic cardiomyopathy, the muscle of the left ventricle is abnormally enlarged or thickened. A cat may have other diseases of the heart, but they will be independent of HCM. It occurs more often in cats five to seven years of age, although the age range of reported cases ranges from three months to 17 years, with most cases affecting males. Heart murmurs in older cats are generally caused by hyperthyroidism or hypertension rather than HCM. The cause for hypertrophic cardiomyopathy may remain unknown in many cases. However, genetic mutations and predispositions are known to lead to HCM in cats. And though not a direct cause of the condition, hypertension and/or hyperthyroidism can further complicate HCM in cats. You will need to provide a thorough history of your pet’s health leading up to the onset of symptoms, including any information you have about your cat’s genetic background. An electrocardiogram (or EKG) recording can be used to examine the electrical currents in the heart muscles, and may reveal any abnormalities in cardiac electrical conduction (which underlies the heart’s ability to contract/beat), and can also help your veterinarian to determine the origin of the abnormal heart rhythms, if they are present. However, an ECG may not be adequate for a definitive diagnosis. Radiograph and echocardiograph (ultrasound) imaging will be more useful for visually examining the heart for enlargement or thickening of the walls, or for thickening of the mitral valve (which controls the flow of blood between the left ventricle and the left atrium). Other conditions will need to be either ruled out of confirmed before your doctor settles on HCM. There are two conditions, which are especially likely to mimic HCM, that your cat will be checked for. Your cat will need to have its blood pressure checked in order to rule out hypertension, and the blood will be tested for high levels of thyroid hormones. Hyperthyroidism will exhibit may of the same symptoms as HCM, such as lethargy, short breath, and irregular heart rhythm. If there is a diagnosis of HCM, your cat will be hospitalized for appropriate care, especially if it is suffering from congestive heart failure, a common outcome of this disease. Your cat will be placed in a quiet environment to minimize stress, and if it is having trouble breathing it will be given oxygen therapy. If your cat’s body temperature is low, your veterinarian will warm the cat in blankets to gently raise the body temperature. The cat should be put on a sodium-restricted diet, especially if there is congestive heart failure, to keep the pressure in the blood stable. Providing a quiet and safe space for your cat, away from other pets and active children, is important to its recovery. Environmental stress may activate the nervous system, placing excess stress on the already overstressed left ventricle, and possibly leading to heart failure. You will need to monitor your cat closely during the recovery period, watching for difficulty breathing, lethargy, weakness, lack of appetite, and painful hind-limb weakness or paralysis. If your cat is being treated with warfarin, its blood will need to be tested to determine whether the drug is effectively decreasing the likelihood of a blood clot. Use of warfarin can also lead to uncontrolled bleeding and bruising. You will need to take care that your cat is kept from activities that may lead to injury while it is on this drug. 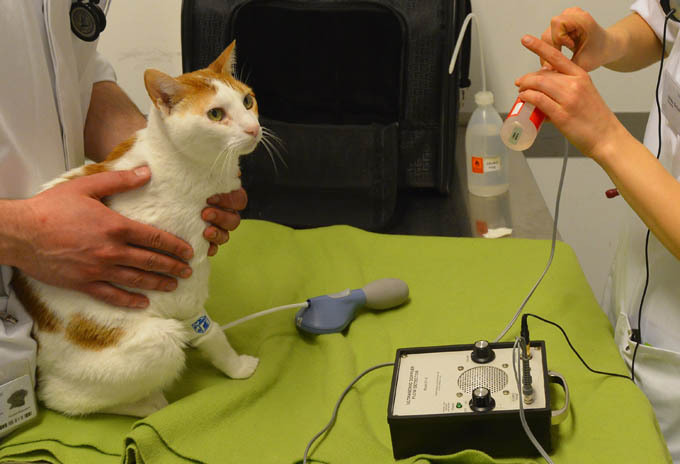 If your cat is taking an ACE inhibitor, or spironolactone, kidney function and electrolytes will need to be monitored. After six months, a repeat ultrasound examination of the heart will be required to determine progress, and whether further treatment will be required.